Great look at a spooled up baitcasting reel. For years I wasn’t actually aware that baitcasting reels were a thing, and a large part of that was due to Dad’s preference to spinning reels, and was also in large part because we grew up in the Midwest where simple spinning reels just made more sense. However, once traveling out in the wider world, it became clear that in some places there was no question that high quality baitcasting reels really bring something to the table. Just because this was the last type of reel I was introduced to doesn’t mean I haven’t spent my hours on the water learning everything there is to know about how they work. 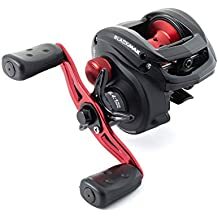 I fully understand better fishing equipment means better results and anyone who has raved about the benefits of their favorite baitcasting reel understands why these top models will have so many fans. 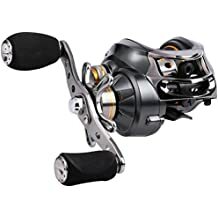 Baitcasting reels are one of the major types/style of fishing reels and appear greatly different from the open and closed spinning reels you might be used to seeing. These reels stick out as they have a fixed spool that is underneath the rod, while the lawn is drawn out by the wait of the lure or bait. A great choice for experienced anglers who need to be able to get additional distance or precision in particularly tricky environments, these reels are specifically designed for getting pinpoint accuracy from casting a wide array of lures like jigs, spinners, and crankbaits. The big difference from spinning reels is that these have a dialed in amount of resistance on the drag which means it takes more skill and more “touch” to properly thumb the spool as the line goes off of a cast. Baitcasting reels can general launch a lure further and are more pinpoint with accuracy once you’re used to them, however they do take time and practice to get used to and in the beginning don’t be surprised if you experience some “backlashes” resulting in large tangles of line. As annoying as it can be in the beginning (and major props to Tom for dealing with my glares while I was learning), taking the time to learn to use these opens up another incredible piece of fishing gear that, in the right circumstances, could mean the difference between a healthy stringer and getting skunked. There are many fantastic open faced baitcasting reels out there, and this goes to show with the size and length of this post! This isn’t a top ten baitcaster list, because to accurately cover the really top notch baitcasting reel designs, we now present you our list of the 15 best open faced baitcasting reels currently on the market. As always we reserve the right to edit, move, or change our rankings as new models come out, changes to manufacturing are made, and the outdoor markets keep shifting. Take a look at this chart for a quick summary or quick glance at what’s there and feel free to scroll down to learn more about any individual one of these awesome reels! Abu Garcia is a name that comes up a lot when talking about baitcasting reels, and it isn’t hard to see why. These baitcasting reels have a reputation for being sleek, lightweight, and stylish to boot. Created with a one piece graphite frame that is further supported with solid graphite side plates, there’s a lot to like about what the BMAX3 by Abu Garcia brings to the table! The ball bearing and power disk systems means a strong but smooth drag. This is a reel that allows you to adjust to help increase your accuracy and ability to use a wide array of lures effectively, as well. 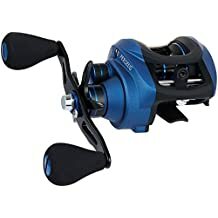 The design is outstanding with a compact handle and comfortable grip that allows you to get the most out of your reel while still enjoying the comfort and support that you need for a long day out on the water. This reel has outstanding features and any parts inside the solid graphite frame are parts made from high quality machined aluminum. 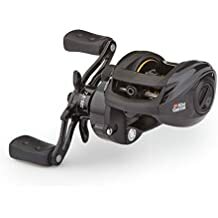 The trademarked MagTra brake system helps make this baitcasting reel especially exceptional for casting among this type of reel and holds up whether you are generally a hobbyist or a serious pro. These are outstanding reels that work with a variety of rods and have done a great job keeping all the benefits of traditional baitcasters while moving to the next level with new materials and design that steps it up in a way that will make dedicated anglers happy! The Sougayilang baitcasting reel is another outstanding offering from the trusted Sougayilang brand. This reel is a mere 8.3 ounces in weight and has a fairly impressive line capacity regardless of the diameter of the specific line being used. Featuring a carbon construction body, solid corrosion resistant side plates, and aluminum & carbon handle means a rock solid reel from solid construction that remains remarkable lightweight, as well. This baitcasting reel is strong, resistant to common wear and tear issues (especially when it comes to corrosion) and features a machined aluminum spool and a state of the art design that allows experienced anglers to get the absolute most out of the reel so they can spend an entire day getting the most out of every single cast throughout an entire day of fishing. This accurate and effective reel allows for on-the-fly adjustment, while the double line winding shafts means you actually get more stability, more durability, and that’s all with the control and accuracy you would hope for from a top of the line reel. This reel comes with an outstanding one year warranty so you can master this reel in confidence you are covered. That’s a lot of security to appreciate. An outstanding option for any serious angler. KastKing is a name that comes up a lot when looking at various pieces of fishing gear, and it should come as no surprise that their models show up yet again in another article on fishing reels. This baitcasting fishing reel is outstanding and once again the Royale Legend and Whitemax are mechanically the same outstanding style of reel from KastKing while each offers a very distinctive look: one classic shiny black while the other is a stunning and eye catching white. 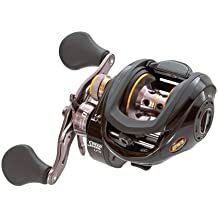 These reels are known for their precision brass gear structure that means an amazing 17.5 lbs of set drag to give an incredibly high level of performance while remaining very low maintenance thanks to trademarked corrosion resistant ball bearings that are specifically designed to run smooth even after years upon years of real world use. As if that wasn’t impressive enough, this reel offers superior control while casting and features a design that gives top notch strength through high quality materials that are also incredibly lightweight. This is a versatile reel great for bass, trout, walleye, and more while also great from shore, boat, or even kayak. In other words, this is the type of outstanding baitcasting reel that you can have confidence in anywhere you go. These are even popular for ice fishing because of the natural drag, versatility, and overall quality. This is one of the best reels out there and it’s easy to see why it’s so popular with experienced anglers. The Piscifun Torrent baitcasting reel is the newest release from the Piscifun company and one that is being met with a lot of support from anglers. This is a powerful and durable baitcasting reel that has an impressive 18 lb drag using their new advanced 3-washer design. For a heavy duty reel the Torrent is surprisingly quiet. Working off an already well received previous design, this is what happens when a very good reel is made great through a series of small but significant improvements. Double wind shafts and a solid magnetic setting system creates strong control and performance while simultaneously also helping to prevent backlash. A lot of focus with this reel goes to the main gear, and rightfully so. The main gear is reinforced and uses the Japanese Hamai Cut system, which creates a level of excellence that helps take this reel from good up to its current position of great. Even the smallest improvements in precision can make all the difference when it comes to truly game changing performance. 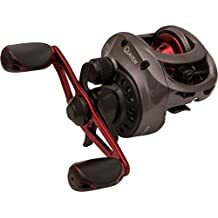 This reel is water resistant, rust resistant, and holds up to hard heavy duty use year after year meaning that you can go out as often as you want knowing you have gear that can hold up to your level of fishing obsession. An added bonus? The quick port oil design makes it very easy to oil up the reel without worrying about losing parts. This is a simple yet ingenious solution to a problem all too many anglers using a baitcasting reel have experienced in the past. You shouldn’t be surprised to see the Abu Garcia name appear once again on this list. Known for their incredibly high quality pieces of fishing gear, the Pro Max low profile baitcasting reel is an outstanding option for anglers looking for distance casting and pinpoint precision. 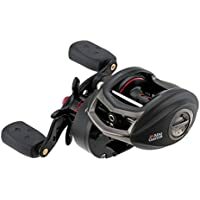 These three styles vary in small ways that you’ll want to look into but they all fall under this overall type of reel and are amazing pieces of fishing gear that many anglers swear performs at nearly the same level as premium fishing reels that cost ten times as much. This reel produces heavy duty long-range casting from a lightweight reel, and has earned strong grades for a design that manages to be durable, strong, and reliable. The MagTrax brake system helps increase both the distance & the accuracy of your cast. The Power Disk drag system keeps things running smoothly and reduces the dreaded tangled line explosions. 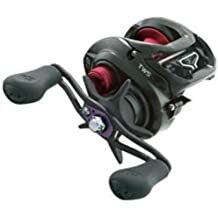 These and even more systems are all loaded into this one reel while its design remains lightweight and gives an ergonomic setup that allows your hands and wrists to stay comfortable and keep going. Daiwa is a name that is extremely well known among anglers of all experience levels, and for good reason. One of the premium names when it comes to great fishing gear, they’re not only about premium fishing rods and open faced spinning reels – they make amazing baitcasting reels, as well! The Tatula CT baitcasting reel is an outstanding option that delivers the level of performance you expect from what Daiwa has to offer and definitely earns its place on this list as one of the best options out there. The Tatula series has earned its reputation for being a top notch model. They are relatively light thanks to precision craftsmanship. The efficient drag and adjustable click system means longer casts using the same effort. The T-Wing system has been shown to create obvious differences casting distance. This is especially true for lightweight lures. With Daiwa’s Tatula baitcast reels you will find a surprisingly technically sound and high quality reel at a price well below the $150-200 range you’d expect before finding this level of quality. A great baitcasting reel with larger handles perfect for those of us anglers who have big hands. For someone like me, a small reel handle is a pain in the fingers, hand, and wrist in addition to the neck. Even better: left and right handed baitcasting reels are available. That means Southpaws should be just as comfortable as your average Righty. This reel is known for its power. An 18.5 lb drag system is impressive. Supported by 3 carbon fiber drag washers as well as an exceptional dual brake system, there’s a lot to love about the engineering behind this baitcast reel from Piscifun. This reel is resistant to corrosion and offers some seriously impressive quality specs. A strong gear ratio, smooth reel, and solid retrieve makes this an easy choice for our top rated baitcaster list. The oil hole in the side plate also means lubricating the reel is much easier than with a conventional baitcasting reel and without any chance of losing important pieces since there’s no opening up the reel. Add in 120 yards of 30 lb braided test line and at that point you are all ready to go! Featuring both right-hand and left-hand models to take care of casters no matter what their dominant hand. In addition to this there are four different gear ratios available. That’s a great plus for advanced anglers who care about every detail of the cast. The name says it all in “tournament ready” and this baitcast reel is just that. The design is look and good looking. Even at a glance it stands out as a top notch choice for anglers of all experience levels. This particular reel isn’t just one of the most highly rated online that casting anglers will run into online, but it is gaining a reputation for being “buttery smooth” while casting. That is really high praise for any baitcasting reel. In addition to many anglers praising the Tournament MB for its smooth casting, there are also many reports of less “birdnest” issues with the reels. Smooth casts with less tangles is good for any angler no matter what the situation. If you go with this reel you won’t have any problems. Very good choice and especially good for someone transitioning from spinning reel to baitcasting. You’ll love the smooth reliable casting this baitcasting reel brings to the table! Yup, that’s right – back to back entries and well deserved ones at that! The LFS speed spool baitcasting reel by Lew’s is an outstanding baitcasting reel. The frame is made from a strong machined aluminum and is a one-piece design. Graphite side plates cover important gears while stainless steel bearings make sure everything runs smooth as silk. This reel provides 10 lbs of drag power while the anodized aluminum spool is perfect for adjusting tension on the fly. A magnetic brake system makes sure the engineering stays top notch. This is an outstanding design. There’s a reason it’s so popular among anglers. The custom padded knobs on the handle give an extra level of comfort, which is always nice. The gear ratio is 6.8:1, and a limited one year warranty comes from the manufacturer. The LFS design focuses on making sure you get even more distance with every single cast. That extra distance and control can even be adjusted even mid-cast. This is an outstanding reel and you’ll be happy with the increased distance and accuracy. Once again an Abu Garcia makes enough of an impression to land on our top rated reels list! The Revo SX from Abu Garcia is a low profile baitcasting reel that delivers on really top notch quality without busting the budget when it comes to price. 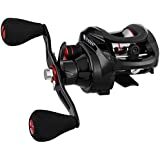 While this isn’t the absolute top of the line model, it is very high quality and delivers well beyond what you usually think of in terms of “budget friendly” reels. As far as the actual schematics, there’s a lot to like here. One roller bearing provides perfect balance to the 9 stainless steel ball bearings. In addition to this the frame is corrosion resistant. That’s the beauty of an X2-Craftic alloy for the frame. Side plates are made of carbon to reduce weight without giving up any structural strength or long-term durability. A strong drag system combines the perfect combination of drag pressure and smooth operation. This is a rock solid reel that will be a clear upgrade for most anglers, even those already used to casting with a baitcaster. The Ambassadeur S round reel is yet another amazing option from Abu Garcia. Made from high quality professional grade components, there’s a lot to love about this reel. Tested for both durability and quality, the Ambassadeur holds up against even the roughest of challenges. This reel is built around a 4-pin centrifugal brake system. This keeps pressure constant through the cast. That helps keep the line smooth, and gives the angler maximum control. Receiving more control while casting is always a good thing. The handle is designed to give an ergonomic feel to make sure your hands are comfortable. There is a model of these reels for both righties and lefties. These reels also have an impressive array of features without overdoing it. In other words these reels are designed to give you premium quality without getting so stuck in the bells and whistles as to lose functionality. They are exceptional reels that give plenty of power and control. This is an outstanding option and yet another example of how Abu Garcia is still completely on top of their game. The last of the Abu Garcia baitcasting reels on this list, but certainly not the least, this silver max reel comes in four different styles. All four have several awesome similarities. They’re all sleek, durable, and deliver outstanding performance. 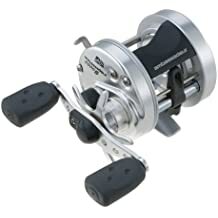 This reliable system uses a combination of 5 stainless steel ball bearings paired with one roller bearing to guarantee consistent and reliable results and a seemingly effortless retrieve on the reel-in. One important thing to note: these are generally made for right handed anglers so if you are a natural Southpaw you may need to look at another model higher up on this list. This is a rock solid reel that has a large number of fans. Many anglers online have lifted this model up as a new favorite. A great reel for bass, a great reel for walleye, this reel is a great top rated option for anyone from beginner to moderate skill level. Yet another outstanding option from Abu Garcia. The Quantum baitcasting reel is lightweight, operates smoothly, and gives a good casting distance. This is a very inexpensive option, which works really well for anglers who are on a tight budget. There’s a lot to like about this reel. The distance casting is good, it’s inexpensive, and fairly reliable. While there are plenty of good things to like about this reel, it is a budget model so there are some common dislikes, as well. Some anglers complain about the hard plastic handle knobs being really uncomfortable, especially over the course of a day. There is a bit of a cheap feel as more parts are plastic as opposed to engineered metal. The settings also can be a bit hard to adjust. Finally, it is worth noting that our ratings are just for the right handed model. For some reason the left handed version of this reel is not nearly as well regarded. Q: What are the defining features of a baitcasting reel? 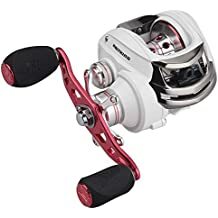 A: Unlike a spinning reel, a baitcasting reel has more of a vertical relation with the line versus bringing it down and around in a horizontal way. The appearance is very different from spinning reels. These reels have a drag system that compensate for many of the things that are controlled by the caster with a spinning reel. Q: Is a baitcasting reel considered an open faced reel? A: Yes. 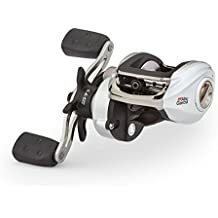 Just as with spinning reels, the face is open and can be seen, but that doesn’t make these a close cousin to spinning reels. The way both reels work is very different and proficiency with one doesn’t mean you are going to be familiar or likely to just pick up on the other. Q: Are baitcasting reels good for saltwater shore fishing? A: Absolutely. In fact if there’s a pretty good tide coming in, baitcasting reels tend to be the better option because for the expert angler who knows how to use them they can cast much further and with more accuracy. Q: What is a really good baitcasting reel for beginners? A: The top picks are the best of the best overall, any of which make for a good beginner option. 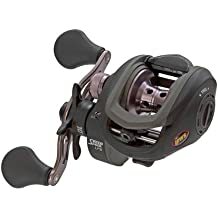 In addition to these top two or three picks, one baitcasting reel that has been lauded for smooth casting with far less tangle problems is the Lew’s Fishing Tournament MB Baitcast Reel. Q: What are the best brands for baitcasting reels? A: Obviously we believe strongly in any of the listed baitcasting reels on this list, but some companies appear multiple times. Abu Garcia stands way out as the top overall company. They hold around half of the total spaces on our top list for a reason. Piscifun & Lew’s both have a couple entries on this list, as well. While they’re not the only “top options” for this type reel, they are a good place to start. This can be quite a different experience from using a spinning reel versus a baitcasting reel, and for those of us who grew up with spinning reels that adjustment will definitely be frustrating at times. That being said, these can be game changers, especially if you want to fish some tricky areas that require distance casting and precision casting. While an open face spinning reel is a great versatile option for beginners, anglers who find they need a little extra control and a good chunk of extra distance, it might be time to give an open face baitcast reel a shot.